Welcome, Bearra! Christy Weidner welcomes Ken Ellis's "Bearra" to Boyertown during the community's March 2008 Third Saturday celebration! "Bearra" attracted assorted Bear Fever fans throughout the day who came to take photos; he enjoyed watching the srprised and happy faces of those who drove by. 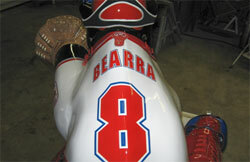 "Bearra" was created by Doug Davidheiser; Doug also fashioned Body Borneman's bear "Box." 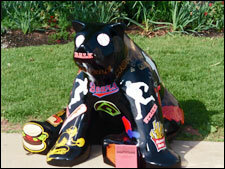 "Bearra" will find his permanent home at Bear Stadium. 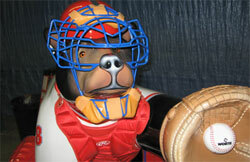 “Kenny,” Ken Ellis’s Legion bear, sports symbols from his favorite sport—baseball. “Kenny” was decorated by Doug Davidheiser in time for the 2005 baseball season, but rumor has it “Kenny’s” uniform will look different by the time the ballpark opens next spring. 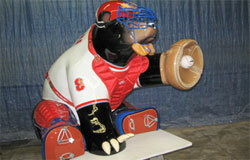 "Bearra," inspired by baseball legend Yogi Berra, was fashioned by Doug Davidheiser, the artist of the Body Borneman bear "Box.. "Bearra" is sponsored by Kenny Ellis, the main man in charge of Bear (baseball) Stadium and the American Legion baseball effort in Boyertown. Ken was an original sponsor of his Bear Fever bear during the first round for Bear Fever's debut at the 2005 Arts Expo. Ken insisted that Doug serve as the artist. But Doug was pretty "burned out," he says, from creating the unique Borneman bear. He had spent countless hours in design, fabrication...and shopping to create just the right authentic look. For the Borneman bear, Davidheiser cut off and refashioned the head and three legs of a walking bear form to create the signature stance of a quarterback in classic passing posture. When it was time to create the Legion Bear, time, energy and inspiration were in short supply; redoing Ken Ellis's Legion bear was a "given." And while three baseball seasons were a long time for Ken to wait, we're sure he is pleased with Doug's latest work. Doug's personal time investment--about 800 hours--equal to the added expenses for materials--are his gift to his friend and sponsor Ken Ellis. Doug is pleased with his latest effort and feels sure Ken will be happy as well...and hopeful that he will forgive him for making him wait so long! Features of the bear will delight Boyertown baseball fans especially. Note the special signal fashioned by the claws and the state championship patch, for example. 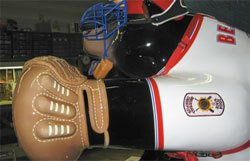 Details about the methods of creating the catcher's mitt will interest sculptors and pie makers! The bear's name and number will be familiar to lovers of the sport, and those who have worn the equipment will appreciate the skill involved in creating it to fit "Bearra." 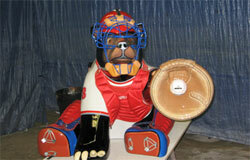 Doug Davidheiser completed Ken Ellis’s Bear Stadium Bear but is not happy with the results and insists “Kenny” will be totally refashioned into a catcher position for the spring of 2006. And once again, like Doug’s Body-Borneman bear, “Kenny” will need to be chopped apart to achieve the effect Doug has in mind.